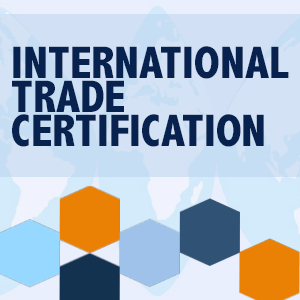 BACKGROUND: The International Trade Certification Program (ITCP) was developed by the World Trade Center Kentucky (WTC-KY) to provide the foundation for effective and efficient management of a company's international trade operations. The program also serves as a great first step for promoting our more in-depth education seminars, trade advisory services, and business trade missions. CURRICULUM: The Certification curriculum is designed specifically for the trade practitioner. Our three-day program is taught by business experts in areas ranging from banking, tax, legal, customs compliance, market intelligence, freight forwarding, international marketing and customs brokerage. Class participants learn from instructors and classmates alike. STRATEGY & RESULTS: The ITCP is hosted strategically throughout Kentucky each year and has an alumni network of over 400 graduates representing 125+ companies and organizations to date. These alumni earn his/her certificate of International Commerce Specialist after three rigorous days of class time and individual testing. The International Commerce Specialist certificate is accredited by the National Customs Brokers and Freight Forwarder's Association of America (NCBFAA). *Attendance at seminar available as continuing education for CUSECO. Please note that there are no refunds after October 28, 2018. We look forward to seeing you at the event! Your email address must be in the WTC-KY member database to receive member pricing. For questions about the program or registration, contact Darren Srebnick - Darren.Srebnick@wtcky.org or 502-574-1566.